Many, many, many years ago (in 1995), The Simpsons aired one of their best episodes, entitled "Bart Sells His Soul." It was during their seventh season (they're currently on their 28th season! ), and it has easily become one of the more classic episodes to fans and critics. The episode starts with Bart handing out hymns to the church-goers as they enter Sunday mass. As it turns out, the hymn is actually a rock song by the band Iron Butterfly. Because of this prank, Bart gets in trouble from the priest. 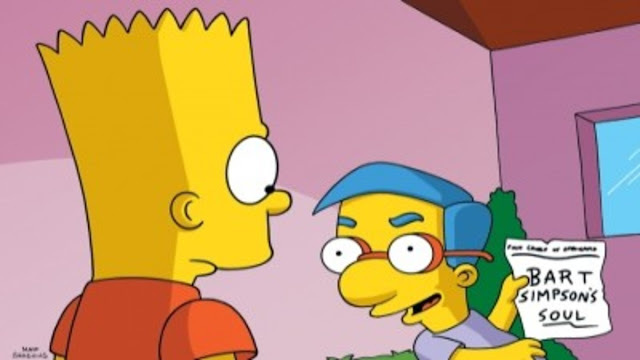 During a discussion with his best friend Milhouse, Bart argues that there's no such thing as a soul, and just to prove his point, he eventually sells his soul to Milhouse. It was written by Greg Daniels, who's famous for also writing and producing King of the Hill, Parks and Recreation, and the US version of The Office. 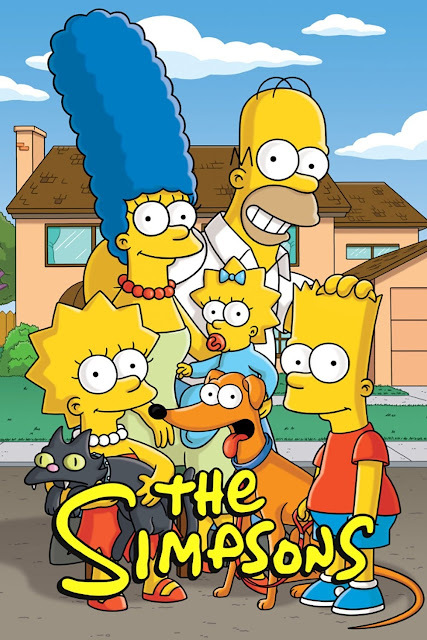 Daniels wrote several more episodes of The Simpsons, many of which are now referred to as classic. As the episode plays out, Bart finds himself in several predicaments that make him believe something is amiss. He runs into motion-controlled sliding doors that don't open for him, he can't produce condensation on a window, he can't even laugh at his father's tragic, yet hilarious, accidents. Lisa attempts to make Bart laugh at Homer's accident. The Simpsons have been in my life ever since The Tracey Ullman Show premiered these boundary-pushing characters in 1987, and I've been a huge fan ever since. I've collected DVDs, toys, artwork, books, T-shirts, etc. My oldest nephew (born in 1991) doesn't know a world without The Simpsons. As they continue to make more and more episodes, it seems the only way the show will end is when the voice actors either retire or pass away. The show has impacted my life in many ways, and going back to those older episodes now, it's become more obvious to me why. They were dismissed by a huge population as a silly cartoon. Others called the show too controversial. Fans knew what the show really was: groundbreaking. Fortunately, time has been extremely good to the series and its reputation is no longer that of a dumb show. Even though the show first focused on Bart and his rambunctious behavior, the writers quickly began to explore the other characters and themes. Even though "Bart Sells His Soul" was released in the seventh season, you can find heart-warming episodes as early as the first season. 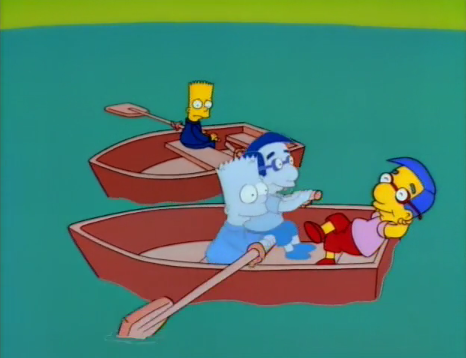 Milhouse gets rowed by his two souls. One of my favorite scenes in "Bart Sells His Soul" is when Bart has a dream. All his classmates are on a beach with a castle-like structure (which looks an awful like the Emerald City from The Wizard of Oz) way off on a distant island. The children are all playing with their souls, and at one point they hop onto row boats towards the castle. Milhouse, with two souls (his and Bart's) rides carefree while the two souls row. Bart, left alone, rows in a circle. There are so many philosophical and cultural references throughout the episode, especially during this dream sequence. There's the idea of the Emerald City being some kind of spiritual destiny, or perhaps a place for heavenly existence. There's the idea of rowing yourself through the long ocean of life. 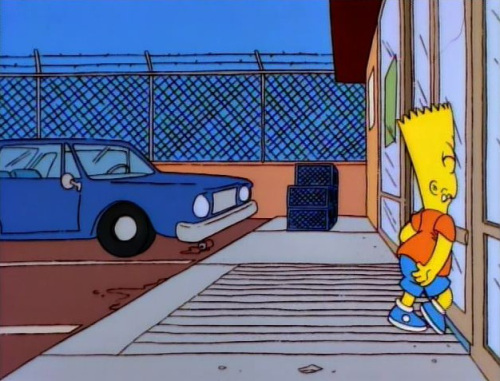 In a scene when Bart is praying, he says, "Are you there, God? It's me, Bart Simpson," which is a reference to the Judy Blume book Are You There God? It's Me, Margaret. At one point Lisa references poet Pablo Neruda. There's so much in this episode, it's as if the team couldn't hold back because of the quality of the episode's story. 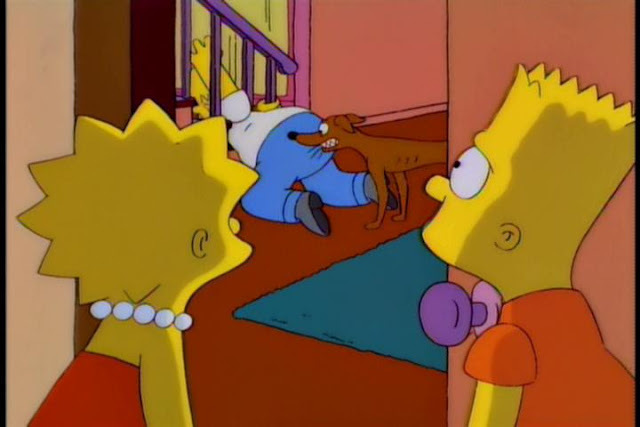 Bart runs into a sliding door. A few months ago I was asked if I would be interested in teaching an honors course of my own creation. The course had to include a subject that a student would normally take (mathematics, literature, history, etc.). It was suggested to me by my boss that I teach something relating to The Simpsons since I was such a huge fan. It took all of 24 hours for me to get the idea of teaching a course that focused on The Simpsons and everyday issues. Later, the course description became more about the show and philosophy. I pitched the idea to the head of the honors program and it appears the course will be offered in the fall of 2017. Although this is the first time that this university will offer a course like this, I'm not the first to have this idea. In fact, many universities have been teaching something relating to The Simpsons for many years. I was always jealous of those students because I would have loved to take a course like this. My point being that the series has not only gained respect over the decades, it has become a cultural staple. If you never watch another episode, at the very least you should watch "Bart Sells His Soul". To list the best of the series would be impossible, but this is easily one of my top favorite episodes. You can bet that it'll be shown in my course next fall. TRIVIA: Writer Greg Daniels was inspired by an experience in his youth when he tricked a bully into selling his soul to him.